A driving tour of the Southwest from Phoenix to Bryce Canyon and the other southern Utah national parks takes you through some of the most breathtaking desert and red-rock country in the world. With at least 25 national parks, monuments, and recreation areas within a 500-mile radius of the city, you can plan an itinerary from one to 10 days with stops at some of the country's most iconic landscapes, including the Grand Canyon, Montezuma Castle, and Monument Valley. Some of them you can reach on a day trip from Phoenix, while others require at least one overnight, either en route or at the destination. Arizona may bring to mind heat, but as you gain altitude on the way to Sedona, Flagstaff, and the Grand Canyon, you can experience cool to cold temperatures, especially at night and in the winter. Use these distances and approximate driving times, which take into account the fastest and most straightforward routes with normal traffic, to start planning your tour. Arches National Park, Utah 472 miles 7.5 hours Located in eastern Utah, next to Canyonlands National Park. Bryce Canyon National Park, Utah 425 miles 7 hours Located in southwestern Utah, not far from Zion National Park. Canyon de Chelly National Monument, Arizona 294 miles 5 hours Located in northeastern Arizona, north of Petrified Forest National Park. Canyonlands National Park, Utah 459 miles 7.5 hours Located in eastern Utah, next to Arches National Park. Casa Grande Ruins National Monument, Arizona 55 miles 1 hour Just southeast of Phoenix, an easy half-day trip. Chiricahua National Monument, Arizona 232 miles 3.5 hours Located in southeast Arizona, near Fort Bowie National Historic Site. Coronado National Memorial, Arizona 281 miles 4.5 hours Located near the southeastern border of Arizona and Mexico. Grand Canyon National Park (South Rim), Arizona 231 miles 3.5 to 4 hours Located in northern Arizona. Hohokam Pina National Monument, Arizona 38 miles .5 to 1 hour In Chandler, Arizona, close to Phoenix. An easy day trip. Hubbell Trading Post National Historic Site, Arizona 272 miles 4.5 hours In northeastern Arizona, not far from Canyon de Chelly National Monument. Joshua Tree National Park, California 246 miles 3.5 - 4 hours Due east of Phoenix in southern California. Lake Mead National Recreation Area (Boulder City, NV visitor center), Utah/Arizona 262 miles 4.5 hours Located in southern Utah/northwestern Arizona, not far from Las Vegas. Montezuma Castle National Monument, Arizona 102 miles 1.5 hours In central Arizona, north of Phoenix, on the way to the Grand Canyon. Navajo National Monument, Arizona 282 miles 4.5 hours Located in northeastern Arizona. Could be explored on the way to or from Canyonlands and Arches National Parks. Organ Pipe Cactus National Monument, Arizona 127 miles 2 hours Located in southern Arizona. Petrified Forest National Park, Arizona 212 miles 3.5 hours Located on I-40 in northeastern Arizona. Pipe Spring National Monument, Arizona 352 miles 5.5 hours Located in northern Arizona. 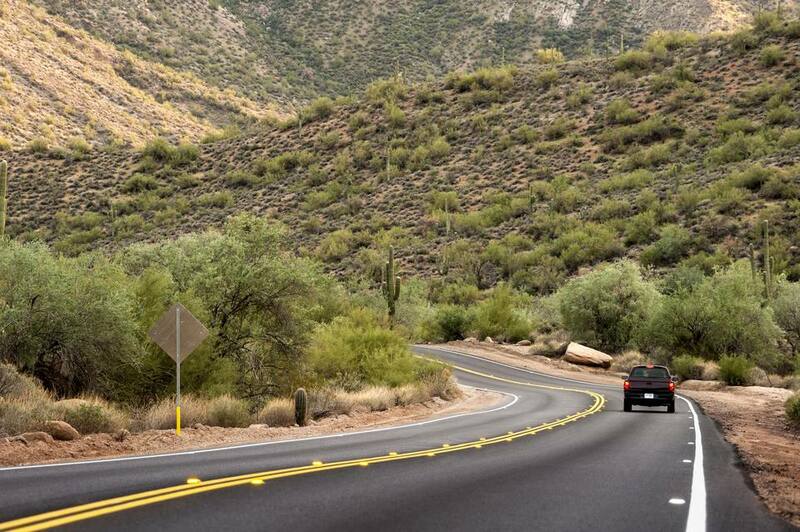 Saguaro National Park, Arizona 110 miles 2 hours Located in southern Arizona, next to Tucson. Tonto National Monument, Arizona 107 miles 2 hours Located east of Phoenix. Tumacacori National Historical Park, Arizona 161 miles 2 - 2.5 hours On I-19, south of Tucson in southern Arizona and near the border with Nogales, Mexico. Tuzigoot National Monument, Arizona 108 miles 2 hours Located in central Arizona, west of Sedona. Walnut Canyon National Monument, Arizona 160 miles 2.5 hours Located in central Arizona, north of Phoenix near Flagstaff. Wupatki National Monument, Arizona 188 miles 3 hours Located in northern Arizona, near Flagstaff. Zion National Park, Utah 414 miles 7.5 hours An awesome park in southern Utah, often enjoyed on the same trip along with Bryce Canyon National Park.